Posted on March 14, 2019 at 10:01 am. Wondering what your SEO company is doing to generate all those backlinks (despite the fact it’s not moving the needle AT ALL for inbound traffic, calls or business)? I just got off the phone with a firm questioning their current agency’s reports that were assuring the client they were generating hundreds of backlinks a month. This was delivered along with a thick slice of “SEO is a long term game, you just need to be patient” cake. So we dug in a bit deeper to see just what was going on. Apparently, they’d gotten 93,000 new links over a roughly 6 months period. From a total of 11 referring domains. Here’s what the backlink profile looks like according to aHrefs (and btw, yes Google can algorithmically ID these patterns). A massive influx of links at a certain time. 93,000 links coming from just 11 domains… which is not indicative of someone organically linking to interesting content. This is reflected in the DR (Domain Rank) score put out by the aHrefs tool. Note that these scores are always bad estimations of Google’s perspective of a site’s overall authority, but they are directionally useful. For context, for a client like this (criminal defense in a mid-sized city), Domain Rank scores should be in the 35-45 minimum range. 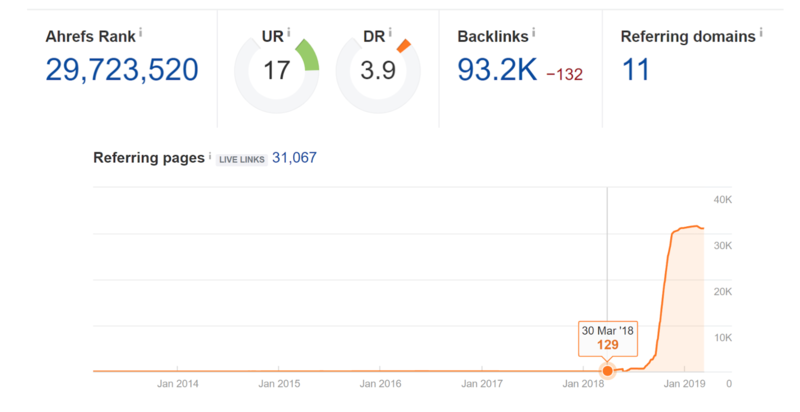 If you want to go even deeper – the aHrefs tool shows exactly which domains the links are coming from (in our example, 99.9% of the site’s 93,000 backlinks came from 2 of those domains… not coincidentally owned by the same company). Note that this is an extreme example which I selected to illustrate the point. Overall the reporting is going to be much more nuanced… but still worth watching especially when your agency tells you they are busy building backlinks but won’t show you the results. Posted on July 17, 2018 at 9:32 am. You’re the small fish in the ocean. The ocean is filled with sharks. As a local business, you are faced with the challenge of finding ways to compete with bigger companies with possibly more years of experience and undeniably deeper pockets. So how can you make the most of what you have? Consider three practical suggestions to make sure you put out content that will make others want to link to you. Take the initiative to put together a calendar or lists of local events and attractions that will pique the interest of your target demographic. Not only will this make you stand out against your competition, but it will help your business be top-of-mind when potential clients are browsing for events in the area. How-to lists are ideal for encouraging this type of result. A personal injury lawyer may want to create a checklist for what do to after being in a vehicle accident, while an immigration attorney could opt to publish an FAQ page for common issues clients face. Video can be an invaluable tool to have in your repository, but don’t be tempted to have video for the sake of having video. Consider what content will be most useful to your clients and focus less on generic company updates. For example, a criminal lawyer could produce a video along the lines of, “What You Should Do if You or a Loved One Have Been Charged with a Crime” to cater to the practical concerns of potential clients. One move to appease YouTube’s ranking system is to entice users to stay on YouTube longer, since your channel is rewarded the longer the Watch Time of your user (a.k.a. the more time someone watches that your video stays on YouTube). A practical take on this is to break videos into shorter segments as parts to a series, with having Part 1 then Part 2 and so on. This way, you increase your business’s chances of ranking higher in a Google search. Before diving into a blog post or video production for attracting potential clients, take a step back to make sure you know what will interest them. Ensure that what you are creating will be useful for your target audience. Your goal is to make helpful content for people that are in need of your services, and for that content to be the stepping stone that leads new clients straight to you. Posted on June 12, 2018 at 2:56 pm. Posted on April 2, 2018 at 12:20 pm. Bird Droppings: Google Q&A…and More! Posted on February 27, 2018 at 7:30 am. Multi-lingual firms – make sure Google can understand what language your pages are in, all the way down to the image alt attributes. As more and more users utilize the Google Questions feature of GMB, you may be wondering how and when you can act on mis-information about your law firm. Looking to take advantage of this new Google My Business feature? Columnist and local SEO expert Joy Hawkins explains everything you need to know about Google Q&A! Google adds Q&A Notification options to GMB. WordPress releases maintenance update to 4.9.3 and fixes 34 bugs from previous version. Beginning July 2018, the popular internet browser Google Chrome will mark all HTTP sites as “Not secure.” Google continues to move toward a more secure web by encouraging sites to adopt HTTPS encryption. WordPress’ new maintenance release fixes a bug in 4.9.3, which will cause sites that support automatic background updates to fail to update automatically. Google removes “view image” button from search. Posted on January 29, 2018 at 10:55 am. Bird Droppings : Stop Googling Yourself! Google provides another reason to embrace mobile users. Legal Connect with Google and Mockingbird. Posted on December 22, 2017 at 1:04 pm. Welcome to another edition of “Bird Droppings”. A simple list providing links to recent articles relevant to legal marketing. Using the Bird-droppings Slack channel in our office, we have provided another list of helpful links to get you through the holidays. As 2017 comes to a close, Joy Hawkins provides a list of all the changes she’s tracked along with some things that are to come. Celebrities can use Posts on Google to answer questions with video that are served up in search results (on mobile). Is this going to be expanded to Local Businesses too? Early Christmas present from Google: Google now showing 12 months of data in Google Search Console! Is your new year resolution to clean up your tagging and track your campaigns effectively in Google analytics? Annie Cushing helps you learn from other people’s mistakes. Another reason from Google on why your law firm must embrace mobile users and create a great experience on smaller devices that is technically sound. Bird Droppings: What’s happening with featured snippets? And reviews, the top local ranking factor. Posted on December 6, 2017 at 5:30 am. Featured snippets are a prime SEO target. Quality content and a number of other factors can help get your content into a featured snippet like a question answer box at the top of SERP’s. The SERP’s are always changing and Google is trying to serve up the best possible content for it’s users. When you have an article in a featured snippet and suddenly that snippet is completely gone from the SERP’s – your traffic can dive drastically. Search Engine Land begs the question – Is the featured snippet bubble bursting? We don’t believe the bubble is bursting and the tactics to rank for snippets are going to help you across the board anyways. 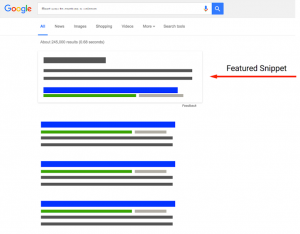 Have you wondered how to rank in featured snippets? There may be a formula! Search Engine Journal dives a little deeper into the most prominent local ranking factor (Reviews) from Local SEO Guide’s annual study. Moz has written a “Next Level” guide on how to track the right keywords and locations for your business – focusing on geomodified searches and localized results. As local becomes more important, this kind of research can help guide your marketing tactics. Another top 10 article! Weird right? Search Engine Land hosts the Local Search Associations Top 10 local search insights of 2017. Is your content easy to digest? As the algorithms and robots get less “robotic”, the human elements become more important. Our favorite SEO plugin believes that Readability Ranks! If you’re considering spamming your way into the local listings or hiring someone who might, think twice about the implications and what that says about you as an attorney. Check out Chelsey Lamberts review of Mockingbird on Lextech -> toots horn! As always, thanks for reading, and let us know if you have any fantastic new SEO resources or Legal Marketing articles. Bird Droppings: Google Posts might impact search ranking! Posted on November 15, 2017 at 6:30 am. Welcome to our second “Bird Droppings” post, offering a roundup up recent articles relevant to legal marketing. Aside from a little Fantasy Football and College Football trash talk, our internal messaging is mainly for sharing our favorite SEO, marketing, and legal marketing content. It’s been a slower few weeks on the news side of things, but we’ve still found plenty of items worth reading and sharing. Check them out below! Do Google Posts impact ranking? A case study – A recent study by Joy Hawkins shows that frequently utilizing Google Posts may be a positive ranking factor in local searches. No Manual Action? Don’t Submit a Disavow – More from Google’s constant fight against spam… If you have bad links pointing to your site, but don’t have a manual penalty against your site – you no longer need to submit a disavow file for those bad links. Local SEO Guide published their Local SEO Ranking Factors Study for 2017! Moving offices? Our local expert Dustin Curtis shares his experience moving an office properly online. <– Tooting own horn. A great post on linkbuilding techniques by our friend, Ross Hudgins. Get back to the basics with 10 SEO tips from Lawyernomics. What Drives Clients to Love or Hate Their Attorney? – AttorneySync explores the question with a data-driven study. Small Thanks with Google – A google campaign to get small businesses thinking about their online reputation and to encourage other clients/customers to participate in leaving Google reviews. Yelp is seriously cracking down on review requests. If Yelp determines your business is systematically soliciting reviews, your business listing may get hit with a ranking penalty. Read about Yelp’s solicitation penalty here. WordPress 4.8.3 Security Release – Security update released on Halloween preventing a vulnerability that may be introduced by some plugins and themes. This kind of security release is more important for sites hosted WITHOUT managed WordPress hosting like WP Engine. In fact our host – WP Engine rolled out this update automatically on Nov 1st. We love daily backups, host security measures, and automatic updates! Did you find any of these articles helpful? Please share your thoughts with us in the comments below!